We try to spotlight fatherhood programs in the news when we can. We do this for many reasons, but one is to encourage you. We want you to know that you are not alone. You'll see in this post, there are men like Darnell W. Parker Sr. out there serving alongside you. We are with you. Be inspired to keep doing the good work of serving fathers and families. 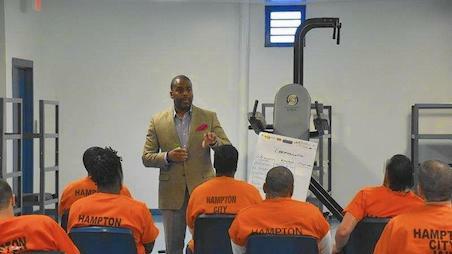 This group at the New Hampton Jail, along with the Hampton Sheriff's Office, is doing great work. We talk about the father absence crisis in America and the challenge of Fathers Behind Bars, but the Daily Press recently featured a New Hampton Jail running InsideOut Dad® and we had to share it. New Hampton Jail is serving the incarcerated fathers who are learning how to be better dads using NFI's InsideOut Dad® program, which teaches incarcerated fathers the parenting skills they need—that some dads have never received. It teaches fathers the importance of ‘being there’ for their children. It's a 12-week program, with sessions about self-awareness, dealing with family history, child development, how to discipline, handling emotions, and handling relationships with their child’s mother. Darnell W. Parker Sr. recently stood in front of a group of incarcerated fathers at the Hampton City Jail to help prepare the men for eventual release. Darnell W. Parker Sr. leads NFI's InsideOut Dad® program for incarcerated fathers at the Hampton City Jail, part of a re-entry initiative by the Hampton Sheriff's Office. Parker told the group of dads, "You are superheroes in your child's life, whether you know it or not." Parker runs the InsideOut Dad® program and leads a Hampton-based therapy group focused on children and adolescents. Parker is a great example as he volunteers for the program in the jail. Speaking of the program, Hampton Sheriff B.J. Roberts says, "It's awesome to have these people come inside the jail and work with the people inside the jail so we can prepare them to come back outside...if you have the ability to do training and counseling and bring in people who really appreciate the fact that these guys are coming back into your community, good things can happen." "Once they go back out into society, they go back to their old surroundings, old people, and it's easy to fall back into their old ways — and then they come right back," says Melissa E. Jenkins, the programs coordinator for the Hampton Sheriff's Office, "That's what we're aiming to reduce". I am greatly encouraged by the work Mr. Parker and the Hampton community is doing. Imagine your community serving incarcerated fathers like this. What would have to change? What would be the result? 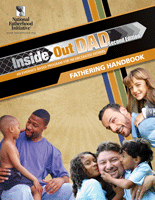 InsideOut Dad® is the nation's only evidence-based fatherhood program designed specifically for incarcerated fathers.